Richard Bland (1710-1776) was a planter, politician and pamphlet writer who contributed to revolutionary literature and ideology in the 1760s. The scion of a Virginian farming family, Bland studied at William and Mary College and qualified as a lawyer (though his family was wealthy enough that he never had to practice). In 1742 Bland was elected to the Virginia House of Burgesses where he served for more than three decades, often filling leadership roles. Like his distant cousin Thomas Jefferson, Bland was well educated, well read and innately curious. Also like Jefferson, Bland was a shaky public speaker but a skilled writer and an advocate for the rights of colonial Americans. 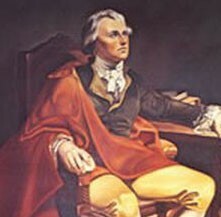 In 1766 he penned An Inquiry into the Rights of the British Colonies, which explored the relationship between the king, the parliament and the American colonies, while defending the principle of opposing taxation without representation. This essay was one of the first meaningful studies of the Anglo-American constitutional relationship, though it did not receive the public acclaim of Bland’s other works. Bland later served as a delegate to both Continental Congresses. He adopted a moderate position in 1775, urging reconciliation with England and arguing against taking up arms. Bland came to support independence, however, though poor health forced him to withdraw from political life. He died several weeks after the signing of the Declaration of Independence.